THE HIGH PLACE: A Comedy of Disenchantment. Title page recto: THE HIGH PLACE: | A COMEDY OF DISENCHANTMENT | BY JAMES BRANCH CABELL | WITH ILLUSTRATIONS AND DECORATIONS BY | FRANK C. PAPÉ [row of four devices] | [in italic] "Build on high place for Chemosh, the abomi- | nation of Moab, and for horned Ashtoreth, the | abomination of Zidon, and for Moloch, the | abomination of the children of Ammon." | [decoration by Frank Papé] | ROBERT M. McBRIDE & COMPANY | NEW YORK: 1923 [row of three devices] (see image above). Title page verso: Copyright, 1923, by | JAMES BRANCH CABELL | [in italic] Printed in the | United States of America | This First Edition of THE | HIGH PLACE is limited to | two thousand numbered copies, | of which this is | Copy Number [handwritten in red, underlined] 812 | Published, 1923 (see image above). New York: Robert M. McBride, 1923. Demy octavo [24.8 cm. (9¾ in.) x 15.9 cm. (6¼ in.)]. Pp. x+314 (with tipped-in frontispiece and seven tipped-in full page illustrations); (i) half-title; (ii) BOOKS BY MR. CABELL; tipped in frontispiece; (iii) title page; (iv) limitation and publishing data; (v) dedication (verso blank); vii-viii Contents; (ix) list of ILLUSTRATIONS (verso blank); pp. (1)-312 text; last leaf blank; pp. (1), (95), and (217) are fly-titles; pp. (2), (94), (96), (216), and (218) are blank; illustrations face pp. 44, 82, 120, 162, 198, 250, and 286. Black cloth; all lettering and decoration in gilt; top edges trimmed and stained red, otherwise untrimmed. Spine: THE | HIGH | PLACE | [rule] | McBRIDE. Front cover: THE | HIGH PLACE | [decoration by Frank Papé] | [device of three diamonds] James Branch Cabell [device of three diamonds] | [diamond device] Illustrated by Frank C. Papé [diamond device] (see image above). Pen and ink drawing by Frank Papé with tissue-guard, showing Florian at the Sabat; inscription on guard sheet [in red, within decorative floral border supported by a cherub and an imp] FLORIAN felt himself to be in not | quite the company suited to a noble- | man of his rank. | [in italic] See page 147 (see image above). To | ROBERT GAMBLE CABELL III | [in italic] this book, where so much more is due. (see image above). 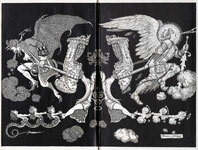 Pen and ink drawing by Frank Papé, showing Florian being torn in two by the Archangel Michael and Janicot (see image above). Dust jacket: heavy dark green paper, printed on spine and front panel only. Spine: THE | HIGH | PLACE | - | [decoration by Frank Papé] | McBRIDE. Front panel: [next two lines enclosed in a single ruled box] THE | HIGH PLACE | JAMES BRANCH | CABELL | [lower left in decorative text] Illustrated | by | Frank C. Papé [ lower right, decoration by Frank Papé] (see image above). Slipcase: Open back light card box covered in black paper, unmarked (see image above). The text on the title page is taken from the Bible, chapter I Kings, v. 11, King James Version, but slightly modified and rearranged. This passage also contains a typographical error - the second word should read "an" instead of "on". This was corrected in the second and subsequent printings. This is the only one of Cabell's first editions to be illustrated by Frank Papé, and the only Papé illustrated Cabell title to be issued only in the USA. There was no John Lane illustrated printing.